Before there was a TV series, there was a tale by the Brothers Grimm. They were a couple of guys who lived in Germany during the 19th Century and collected various folk tales floating around Europe and organized them, giving them a slightly Germanic flavor. The Brothers Grimm first published Snow White and the Seven Dwarfs in 1812, and they put out their final version in 1853. However, even then the story as we know it was incomplete - the dwarfs didn't even have names! There was a theatrical play in 1912 that gave the dwarfs names, but they weren't the names we know them by (Sleepy, Grumpy and so on). That led to the 1937 animated film, which once and for all established (if Mickey Mouse hadn't done it already) the legend of Walt Disney. He is the one who gave the dwarfs the names we know now. Adriana Caselotti starred as Snow White in "Snow White and the Seven Dwarfs." Walt Disney asked Adriana's father, a voice coach, to find someone to do the character voice and singing. Adriana loved to sing - her mother was a renowned opera singer - but she was just a chorus girl. Plucky young Adriana heard about it, stepped forward, auditioned, and wowed everyone. Walt Disney loved her wholesome voice and her ability to convey a child-like innocence before bursting into full-blown operatic-style singing. Walt didn't want his lovely Adriana to become known for other roles, so he kept her under contract and only allowed her to do uncredited appearances after "Snow White." never did much else in film, so she forever after ("happily ever after....") was identified with this role - and, apparently, she loved it. The two other films in which she did anonymous backing voices - "The Wizard of Oz" and "It's a Wonderful Life" - also became enduring classics. Adrian was rewarded with Disney "Legend" status in 1994. Without the success of "Snow White and the Seven Dwarfs" (click on that link for my review of that classic film and more pictures), there probably wouldn't have been a "Wizard of Oz." There have been numerous re-releases over the decades since, and they continue to this day. "Snow White and the Seven Dwarfs," originally put together from footage assembled by multiple directors by supervising director David Hand, was released on Blu-ray Disc on October 6, 2009. It was the first of Disney's films to appear on the Diamond Editions. A new DVD edition was released on November 24, 2009. The Blu-ray includes a high-definition version of the movie sourced from a new restoration by Lowry Digital, a DVD copy of the film, and several bonus features not included on the 2001 DVD. This set returned to the Disney Vault on April 30, 2011, meaning we have to wait probably several years until Disney releases another package containing the film. If you know how the phrase "Mirror, mirror on the wall..." ends, you understand the cultural impact of this amazing feat of animation. Snow White even has a Star on the Hollywood Walk of Fame for her popularity in selling the first feature animated film to audiences and creating a whole new art form. You can read some more little-known facts about "Snow White and the Seven Dwarfs" here. 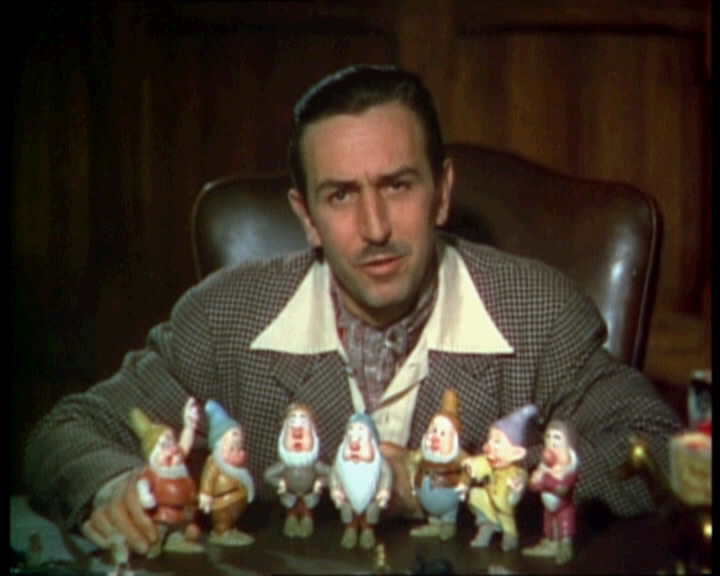 Walt Disney from the original 1937 trailer for "Snow White"